When Someone Has to Die! Introduction - Will God Really Be There When I Need Him? Our awesome Father God, the creator God of the Universe is our need meet-er! Father’s promise is to have the answer to our problems ready before we even recognize we have a problem. What He has done for His people in the past is the same pattern He will follow in taking care of His people today. History declares the God is faithful. In the book of Exodus, the people of Israel’s recent address had been Egypt. They had been the oppressed residents of Pharaoh’s storehouse of slaves for about 400 years. The Old Testament account states after taking their leave of the Egyptians they began wandering through the Sinai desert in a meandering path that would eventually take them to Canaan and the Promised Land. Their survival was the direct result of daily divine intervention by the God of Heaven. God had to miraculously provide water and food for them each day. Each morning, the people would go and gather their food from the ground which God had left for them overnight. He provided a carbohydrate source in the form of a bread-like substance called “manna”. He provided large numbers of quail to catch and eat for a protein source. The people were given some basic instruction for what they put in their baskets. God said, “Only gather what you need for each day. Anything you gather and try to save for the next day will decay and be inedible.” In other words, Israel had to walk in faith and obedience by trusting God to meet their needs EVERY day. As the need became current then the answer appeared. But God meant what He said! No saving for a rainy day as there has never been a rainy day in the Sinai. They had to trust Him as their source to be faithful and not forget them in their time of need. God’s grace is much like the manna in the wilderness. According to the promise of God, His grace will be there at the moment we need it. That is easy to preach until the time comes that we must live by it. My sermon has always been about the faithfulness of God. For 35 years I have had the privilege of declaring the awesome majesty of the Lord Jesus and his incredible faithfulness toward His children in their time of need. Recently on vacation in 2006, my 80 year old mother had to endure a series of unexpected surgeries which resulted in her death. Even though the moment of her death was unexpected, I would be remiss if I said we were unprepared for her home-going at all. All my life our family has prepared for the eventuality of death by living each day to the fullest through a resolute commitment to the Lordship of Jesus Christ. Mom died, even though we had great doctors in a great hospital with a great staff. Mom died, even though we had great encouragement from friends and hospital staff. Mom died, even though we had great faith and great grace. No matter what we prayed or wanted or pled for, Mom still died. It was time for the manna to come down. It was time for a divine intervention to heal our hearts. God had chosen for whatever reason to heal Mom eternally instead of how we asked Him to heal her. Without the “manna of grace” human hearts can get bitter. Without the “manna of grace” humans hearts can stop trusting and hoping. Thank God the “manna” appeared for all of us at exactly the right moment! Our heavenly Father is never early and never late. Today March 19, 2008, I am adding a paragraph or two due to the death of my dad in a car accident on Feb. 17th, 2008. Daddy lived about 16 months longer than my mom. He was incredibly lonely without her but he continued his faith walk in her absence. This death put a finality into our family that was not there after my mom's death. As long as we still had Dad, a part of mother seemed to still be with us. The house, the farms, the cattle business, and church life all stayed the same until his death. Now everything is really different. I am the oldest and must do all the legal things as conservator of the estate. That in itself put a spin on losing loved ones that doesn't taste very good. However, God has been faithful to walk with us through this new chapter of finishing the book so that we can begin a new one with the next generations. We have lost 3 parents in 16 months. My mother died three weeks before we left for Uganda. My wife's father, a godly man also, died in 2007 3 days after we arrived home from Uganda. And now, my Dad dies unexpectedly in Feb, three months after we returned from Uganda again. Sandra's mom, beloved of all her children, is in great health at the time of this writing. 3 godly parents in 16 months is too much, but that does not mean I am applying for God's job. It just means we are trusting Him all the more and we are more dependent on His grace than ever before. I must confess there were times over the years that I wondered if the Grace Manna would be available to me. I have wondered if the Manna would be on time when I was empty and heart hungry for God’s touch & intervention. I think every honest person wonders too. Even John the Baptist wondered and needed a word of encouragement the night before he was martyred and he was the greatest man born of woman according to Jesus. In the midst of my wondering, I want to report that Father has been faithful. Contrary to the “in vogue faith theology” of the day, my victory has never been about me. My victory and yours will all be about Him, the Lord Jesus. My family and I have been feasting on His “Manna of Grace” from the first few seconds after mom was stricken and taken by ambulance for emergency surgery all the way through her funeral and the days afterward as we have attempted to adjust to life without her. This doesn’t mean there have been no tears. Despair, depression, hopelessness and discouragement have all attacked but thankfully the Captain of the Host has fought for our sanity and beat back those that would desire our destruction. Father God will do the same for you and your family if you ask Him. The bible says, “God is not a respecter of persons.” Since He loves you as much as He loves me, I can declare that when the “Manna of Grace” is needed in your life, He will be as faithful to you as He has been to me. You don’t know it now. But you will! Be sure and thank Him when He shows up! We hope these 30 or 40 pages can be a primer for doing basic trauma ministry. The information in this book is the merging of observations that were made when I was a patient in a long term ICU trauma unit and later when I was part of the family in an emergency situation that resulted in the death of my mom. Death is traumatic regardless of who is taken and regardless of the circumstances. The degree of trauma of course is dependent on the intimacy of the relationship you have with the one that gets sick or dies. The degree of trauma is affected by how long the illness was, what kind of suffering the person had to endure, whether you and the family had time to prepare or whether it was an accident that took them suddenly. There are a lot of variables but there is also one common denominator. Death was never intended to be our friend. This whole thing is so new for me. Many face days like this when they are much younger. I have reached middle age with all my parents with me. I have never had to walk this path personally. The closest I have come was my own emergency illness that nearly took my life 10 years ago. Quite frankly during my ministry over the years to 1000’s of people going through this kind of wound I really have been wrong much of the time in my approach to bereavement. My attempt to ministry was always well intended, and theologically correct. The problem is that my approach was not correct according to the law of love which is supreme in scripture. I should have been more concerned with crying with those that hurt rather than helping them get past the tears of the moment. In other words I tried to “hurry” them to the place of victory before the Lord had walked them through the place of grief. I hope you will allow me to share some of the things the Lord has spoken to me about while we were engaged in my mom’s struggle with life and death. These things have altered my thinking about benevolence ministry. They will alter my path the next time we minister to someone in a grief event situation like my family has been in during the past three weeks. Please don’t take these words as a rebuke. Please receive them as if we were all sitting in a “compassion classroom” attempting to improve our handling of peoples hearts in the benevolence and bereavement ministry of the Church. These pages are chronicles of some of the things I learned about myself, my family and about doing hospital and funeral encouragement. Let’s consider these ice breakers to kind of get your mind headed in the same direction as mine. It is later than you think. “That day” comes suddenly. Live each day as if it’s your last. This attitude will keep you prepared for the day when it is. 2 Tim 1:12b “for I know whom I have believed, and am persuaded that he is able to keep that which I have committed unto him against that day. Until “that day” comes God has wonderful Hallelujah things in store for us between our birthday and our going home day. Don’t focus so much on death that you forget to live your life and enjoy those that are living it with you. I don’t think we’re in Kansas anymore Toto! A hospital waiting room is anything but a vacation. The waiting room can be a place of ministry though regardless of our hurt when there is peace in the midst of the storm. Surprise! Guess who’s NOT coming to dinner. o Don’t live in denial to the fact that death is inevitable for everyone. o Celebrate life each day but remember there is a time to be born and a time to die. o Suffering is not the invention of God but His grace is the key to getting peace in the midst of hurt. You are not alone, no matter how alone you feel. You can’t defeat grief on your own. You can’t heal your own heart, or overcome your own hurt. o Grief is sort of the Moabite of human suffering. Do you remember the message that God gave to Jehoshaphat in 2 Chron 20:15b “Thus saith the LORD unto you, Be not afraid nor dismayed by reason of this great multitude; for the battle is not yours, but God's. Death was not the intention of God but His grace to overcome death was. o The empty tomb at Calvary is proof that God is not planning on leaving us twisting in the wind for eternity. I don’t understand everything that is involved in death and dying, but I believe we can say on the authority of the character of God that everything is going to be OK in the end. Death will be destroyed. Satan and his demons will go to Hell. Sin and the flesh will be made a non-issue. These facts however, don’t mean that we are supposed to jump up and down with glee when a loved one steps into eternity. Death is an enemy. Thank God that death is an enemy we do not have to face on our own! Jesus overcame death because He knew we could not. The day is coming when we shall all see the death of Death. What a day that will be! The main thing in an emergency room situation as far as ministry is concerned is to just try and make sure those waiting for family and doctors reports don’t have to do so alone. I couldn’t get to the emergency room in San Antonio to sit with my dad soon enough to be there in time for my mom’s first surgery. A gracious friend and pastor from that city went and took my place. His ministry that day was not what he said but what he did. His ministry was being there. How do you get prepared to see your loved one fall to a huge stroke or heart attack. When would there be a convenient time to see your loved one suffer? How can you be ready to stand there helplessly holding their hand, while it seems to take an eternity for the ambulance to arrive. That is why God doesn’t put the burden on us to make the choice. You can’t ever be ready for a day like that. We don’t want to talk about this much but the deal is that bad things sometimes happen to people. Whether they are good people or bad people makes no difference! Every one will experience this kind of day sooner or later. The reason we don’t want to talk much is because there is nothing we can do to change the inevitability of emergencies we have no control over. Let me underscore this. You have no control and it is later than you think. 2 Tim 1:12b “for I know whom I have believed, and am persuaded that he is able to keep that which I have committed unto him against that day. “That day” comes suddenly. Live each day as if it’s your last. This attitude will keep you prepared for the day when it is your last day. Don’t focus so much on death that you forget to live your life and enjoy those that are living it with you. Until “that day” comes God has wonderful Hallelujah things in store for us between our birthday and our going home day. If there is a hug you need to give to a child, then go do it. If there is a kind word you need to speak to your spouse then go do it. If you need to repair something in a relationship, then go do it. In light of eternal things use your time for things that will stand the test of death, that will be important after someone is gone. Many people I know actually waste their time each day on things that rate very low on the scale of what is really important in life. Sometimes I want to ask them if they are living by design as if they will never die or if they just haven’t thought about what was important in light of their own mortality. Have you ever heard someone say, “He who dies with the most toys wins the prize”? News flash! Bill Gates will probably have more toys when he dies than I will. But Bill Gates and I have something in common. Neither one of us will take anything with us. Anything we are to have in eternity must be sent along ahead while we are alive. If we live selfishly and callously without regard to a relationship with our creator through His son Jesus, then the emergency room will indeed be a very intimidating and lonely place. A life threatening emergency is incredibly devastating even when we have a faith walk with the Lord. I would think facing the emergency room, and maybe then the ICU ward with all the monitors and tubes would be next to impossible without the comfort of the Holy Spirit and without a relationship to a church body full of God’s people. To cut down on the practical aspect of trauma, make sure you have all your medical information in a couple of accessible places that others can find if they need to. Let me make a non-exhaustive list of what your medical emergency file might want have in it. (11) personal letters to each other in the event of untimely death where saying good-bye was not an option. Chapter 2 - The Waiting Room - Going Home or Going Home? I don’t think we’re in Kansas anymore Toto! What a shock an ICU waiting room is when you have to spend nearly three weeks in it. The emotional roller coaster that flows from the monitors in your loved one’s room is devastating. A hospital waiting room is anything but a vacation. However something else happened. We discovered, that in spite of our pain and hurt, the waiting room could also be a place to receive ministry. Our hurt was real and intense but so was the peace in the midst of the storm. Some did it right and some could improve their benevolence serve a bit. Here are some waiting room tips. For those of you feeling the bewilderment of the ICU experience here are a few small practical things to know. a. There are web sites on line that you can check out any doctor, any hospital, and any procedure. Keep searching until you are comfortable with the caregivers, and their decisions concerning your loved one. b. ICU waiting rooms have different rules than private rooms. You will not have as much access as you might think. c. If a loved one dies “out of state” there are papers that must be filled out at the hospital after the death certificate is signed. The hospital and the funeral home you are using will be able to tell you what is required. The papers are necessary to transport the body across state line. Most of the time the body is flown back because flying now days is actually cheaper than ground transport in most cases. d. If a person dies out of state they must be embalmed before they can be transported home so expect some delay as the arrangements are worked out. To talk or not to talk! Let the family make the choice. Bring your own book. Be ready to visit if the family shows a propensity for talking but let them make the call. Some people do better reading a book or writing in a journal when sitting for long periods of time in a waiting room. Some like to visit with others. The family needs to have the freedom to make that call. During the hospital time, if the family has each other, don’t stay too long. They may feel compelled to entertain you by visiting. Talking is a release for some people but for many more, talking is a drain on their physical and emotional strength during a long hospital stay particularly when the patient is in ICU. Can you hear me now? Cell Phones need to be managed carefully. Turn the ring tone down if you are “on call”. The best thing would be to turn the phone off for a little while to be able to give your attention to the ones you came to see. If you take a call, go somewhere else to talk because loud conversation tends to stress out the others in the waiting room that are waiting on news about their loved ones too. I can’t tell you how annoyed I got when we were trying to talk to Mother’s surgeon and a lady in the room took a cell phone call and talked loud enough to be heard in the next room. That kind of stuff is just inconsiderate. Now let’s see. What about this equation. Emergency surgery. 14 hours a day in an ICU waiting room. Frayed nerves. Tired bodies. Inconsiderate behavior. Sounds like a breaking news story at 10 waiting to happen. Get my drift! Conversation in the waiting room - BE CAREFUL what you talk about. It is more important for you to be there than to be there and talk. If you have a tendency to talk to pass the time when you get bored please just stay home and pray. Another way to manage this concern is to have a plan to go and just make a short visit. Stay 15 minutes, have prayer and then leave. The 15 minute compassion visit is the kind of visit which is always welcomed and is long enough to let the family know you care about their pain. No one wants to see your scar! If the family is facing serious surgery on a loved one or maybe the impending death of a loved one don’t talk about all the problems you’ve had with similar circumstances. Hearing about your surgical problems or problems with the doctor who treated you or the hurt you experienced with the death of someone you loved is not a helpful thing when the wound is fresh in an ICU waiting room. Hope is hard enough to come by without some well-meaning friend pouring cold water on what little hope we have left. In San Antonio, when they were talking heart bypass surgery for my mom, a “well meaning” deacon from a local church came to the hospital to visit. Within the first 60 seconds of sitting down with my dad, this “well meaning” brother was telling us about his surgery. He told us how much pain he had had and about getting an infection. He lambasted the surgeon that had done the work, who unknown to this deacon was to be the doctor that would have been cracking open my mothers chest later in the week if we could have gotten her healthy enough to do bypass surgery. My dad was hysterical with worry after the guy left. This same deacon came again the next day during a time I was gone and talked incessantly for two hours. My dad was too kind to interrupt and tell him to be quiet. Later on when dad told me about the visit he said, with tears in his eyes, “I thought I was going to scream. He wore me out. Didn’t he know my wife was trying to die and that was all I could deal with at the time?” Well obviously he didn’t know. Some would say the deacon just didn’t care and that would be wrong too. He does care. I know him very well. He is a very caring man. He came to the hospital because he cared. His problem is that he has never been trained. This is why I am writing this little booklet. Anyone that reads this will have no excuse for doing it wrong. Denial can be an emotional hedge to get us through the day. It’s true that we should not live in denial that death is inevitable for everyone. However, when death actually comes denial can sometimes be a natural emotional protection against overload. Denial is destructive when we choose to live in it for weeks, or months or years. But a certain amount of denial is nothing more than the Lord gradually breaking us in, to fact that our loved one is with Him now. Crossing the bridge before you come to it is a good thing if you can. Fight the foreboding call of death by celebrating each day of life you have with your family right now. Eventually death will touch us all and we know this to be a fact. An amazing reality I have discovered in counseling is that we are all surprised when it does. Try to prepare by remembering there is a time to be born and a time to die. No matter what kind of preparation we make our only hope is still the touch of the Lord. Let’s divide our thoughts into two categories, practical and theoretical. What kind of place is Grief Ministry. Grief Ministry is the place where God touches the hearts of those in pain by using us to be encouragers. The “Nine Places” of Grief Ministry. Grief ministry is a Quiet Place – Walk them through. Don’t talk them through! Silence really is golden and can be a powerful tool in helping someone face the loss and trauma that surrounds a death. Silence can never drown out the voice of God but we can if we talk too much. Broken hearted people need to hear from Him more than they need to hear from us. These situations can be difficult and uncomfortable because honestly most of the time we just don’t know what to say. Grief ministers are not called to be “fixers”. For whatever reason, human beings feel they are expected to say something to make things better. I actually think the motivation is compassion. Pastors, church leaders and friends often make the same mistake of attempting to speak some great deep truth that will hopefully wipe away their tears miraculously. Most of the time we just start talking without a plan, or a rhyme or reason. My grandfather would say that is going off “half cocked”. A gun that is half cocked is not functional. All it is good for is a bluff. Benevolence ministry better be more than a bluff or there will be long term casualties. Many times what we say off the cuff ends up being wrong or poorly timed or just a drain on the emotional reservoir of those that are hurting. Love is never pushy! I know this is redundant but read it anyway! Most of us (granted out of compassion) seem compelled to come up with little theological sayings which are intended to propel our hurting friends past their grief and into shouts of praise in response to their loss. Ecclesiastes says there is a time for everything. There is a time to live and a time to die. But dear heart when faced with the death of a righteous soul there is a time to grieve that precedes the time to praise. Be aware of other family members, friends and relatives that are around listening to what you are saying. IF they are not believers their take on your words will be totally different. Although the one you are ministering to may know the Lord, other family members may not. Be sensitive to their hurts because their grief is completely different from those that are born again. If you get preachy they may feel they need to leave the room. Acknowledge them and their hurt with love and compassion. Be really careful about trying to evangelize at this time. The Holy Spirit will lead in this area. Just make sure you are listening well. Grief ministry is a Safe Place – Losing the love of your life generates a need to be in a safe place where weeping and wailing are acceptable until there are no tears left. Don’t try to dry their tears too quickly or insinuate that they should. When there are no more tears there will be room for praise and thanksgiving for a life well lived for Jesus. If tears are dried too quickly a dangerous situation arises. Therefore try to console but make sure you don’t try to repress. Delaying or repressing natural grief responses until a later time could mean there may not be anyone around to hold them when they finally do release their tears. You are God’s hands and God’s voice in Grief Ministry! He uses us to touch the empty heart! Grief ministry is a Supportive Place - No, never alone! God has never intended for anyone to suffer alone. Crying alone is fertile ground for despair, depression, and discouragement. Grief ministry is a Praying Place - Heart wounded people need people that can bathe them in compassionate praying. Broken hearted people don’t need passionate preaching or theological outlines and principles at such a difficult time. Broken hearted people need to know someone is crying with them. Don’t try to fix someone that is grieving a loss. There is only one “healer” and you ain’t Him! Grief ministry is a Helping Place. Your goal is to make things better not worse. Emotional shock is normal during the initial stages of bereavement. Shock numbs a person’s ability to make decisions, or to process the abstract concepts of theological truth. When we try to talk someone through their grief at a pace that seems right to us, we’re taking a huge gamble with their heart. We will usually waste our time as well because healing won’t come until God does it. Another consideration is that someone still in shock won’t remember most of the theological things we say unless our words increase their wound. Listen very carefully to a word of warning !!!!!! If our words increase their wound they will remember everything we say, for a very long time. Grief ministry is a Loving Place. Just loving on them during their hurtful times creates trust. This will release them to know it’s ok to deal with their grief while someone is around to cry with them. Some words are better than others. The words “I love you”, or “I am so sorry this has happened” are appropriate. Words like “we just have to trust God”, or “they are in a better place” are true but not appropriate for bringing comfort until later on. Grief ministry is a Protecting place. Try to not add your grief to the grief of the family if at all possible. They already feel their burden is more than they can bear. Even if they can, don’t make them take on your burden too. Travail in prayer for them. Try to not complain about your own problems or the loss you may be feeling at their loss. Grief ministry is a Listening place. A good listener will never be out of place. My friend Rick Griffin says, “Lots of people need to change the channel on their radio. A lot of times we get to broadcasting when we ought to be receiving!” Don’t give a lecture on faith if they cry a little more than you think they should. Listen to their hurts, without offering correction. Grief ministry is a Patient place. Be ready to invest some time in theirs tears. We must be willing to wade with them through the boxes of Kleenex until Father God in His timing turns their screams of pain into shouts of praise. Make sure no one suffers alone but don’t hurry them to reach a place of victory. When is the right time to make those truthful declarations about a believer being in a better place? Pay attention to the next point! You can start saying those “She’s in a better place” things to me, after I am able to say them to you first. Remember, we are not there to fix them but to stay around until God does. I’ll use myself as an example. When Mom died in the hospital, I needed time to get to the place I could say, “My mom is in a better place.” I mean duh! I knew she was in a better place. It is not that I didn’t know. Even though I knew she was in a better place I still just wanted her to be in this place with me. I needed time for the Lord to repair my heart. Give the Holy Spirit time to help me release my mother to Him otherwise your well intentioned words will be used to wound rather than encourage. Trust me when I remind you that the enemy is just lurking around to try and take things meant for good and use them for evil. We must be wise with our words so that the enemy of God and Man does not use our words to steal joy, kill hope, and destroy peace of mind in those trauma moments when God’s intention is to be closer than a brother to us. It is a wonderful thing when a broken heart is able to speak words of faith like “she’s in a better place”. Those words are a sign the Lord has taken them to the healing place and they are ready to speak openly in fact what they already knew in faith before the loved one died. Only Jesus has the power to defeat those enemies in our dark days. AND I can tell you He will and He did for me last week. The problem is that we have a tendency to try and do Holy Spirit’s job for Him when our friends and family are hurting. We try because of love to hurry up the process of going from pain to praise. We must not do this! Let Jesus determine how long a person will cry. Why are the words, “they are in a better place” not always appropriate? 1. Ask simple questions. Do you need anything? How can I pray for you? 2. Don’t ask too many detailed questions about the hospital stay or how someone died. Questions to avoid are “How do you feel?” or “What was it like to go through this?” or “Did he or she suffer much?” You get the picture don’t you? How would you like to relive the details of the death of your wife or husband 25 or 30 times a day, for 3 or 4 days after their death? It is one thing to be asked once to give a blow by blow account to your immediate family about an emergency hospital stay or the death of your loved one. It another thing entirely to be asked to tell the story again and again before your loved one is even buried. 3. Why it’s wrong to ask for details about the hospital or about how someone died? The events surrounding serious illness or death are about the patient and the family. The focus must be on them not on you. It is not about your right to know or your curiosity to know or even about your intention to help. The focus must be on what is best for those actually walking through the valley of the shadow of death. Christian compassion dictates that you allow the family to determine how many details they want you to hear or whether they want to share details with you at all. If they want you to know they will tell you. If they don’t volunteer the information then don’t ask! 4. Do Unto Others . . . Golden Rule Benevolence - Put yourself in their shoes. One day it will be you. Choose questions with answers that you would want to discuss if you were in their place. Guard your wounded friends by not asking questions that will put them in a position to relive things that could actually increase their stress, rather than relieve it. Be part of the answer, not part of the problem. If you ask for details, the family may feel compelled to give them to you even though they would rather not. 5. Read between the Lines! We live in a very hospitable southern culture where people would almost rather lie to you than take a chance of offending you. Just because they are talking doesn’t mean they want to be talking. Most people will ignore their own needs (which in this case would be to not have to share the details) to make sure they do not offend or appear unapproachable to those that are just trying to pay respect to the departed love one and the family left behind. 6. Friends watch each other’s backs! We must take care of them when they can’t take care of themselves. Most people will never be honest enough to say, “we would rather not discuss that right now,” or to say, “that is just too painful to talk about right now.” Make sure to attempt to lead no pressure conversations! Here is my point . . . if we love them, why would we take the chance at all that careless conversation would put more pressure on our friends than what they are already enduring naturally during a time of great loss? 7. Don’t put someone on the information “spot”! Don’t intentionally put them in the “crosshairs” of frustration. Be content with whatever information the family gives you without asking for more. There will be plenty of time later to hear the whole story. You may respond to this by thinking or saying, “Well if they don’t want to tell me they can just say so and that will be alright.” This is wrong thinking for several reasons. (1) Have you ever been asked a question, and stood there thinking to yourself, “what can I say that will sidestep the real answer I am not comfortable giving. I don’t want to tell a lie or be rude but I am really uncomfortable with these questions! (2) Did you know that grief clouds our judgment and really alters our perception of reality? This is one reason we must be careful what kind of questions we ask a family or individual going through a grief event. Surprise plus shock is a deadly combination. Most of us do not think well enough on our feet to respond the way we would want when we are surprised. Most of us don’t respond well when some outside event clouds our ability to think clearly either. We don’t want to put added pressure on a bereaved heart by asking questions that require answers or choices that they might not actually make if given time to think or reflect in a less stressful situation. Off the cuff responses are usually not representative for what a person really thinks. Sometimes off the cuff responses are not even factual because our minds are not functioning properly due to the stress of a grief event. Tongue in cheek moment! I always respond to questions and stressful situations the right way. My problem is that my proper response is usually about three days later after I have already said or done the wrong thing. This is the kind of situation is where that saying, “hindsight is always 20/20” comes from. When I am surprised or under stress, I usually think of what my response should have been to a particular question or situation after the fact instead of in the heat of the battle. Man shall not live by bread alone but sometimes it helps! 1. Some has to organize the tasks. Elect a benevolence CEO and be willing to be a VP to help the CEO get the job done. The local church is the best equipped group to take care of the physical needs of a bereaved family. If you have a church family, try to elect a coordinator to organize what food is brought so there won’t be tons of salad and pie and nothing else. 2. Benevolence is about serving. Check with the family for a list of preferences concerning food choices. Are you really trying to help? Yes, I believe you are or you would not be spending the time to read this paper. Wouldn’t it would be counter productive to take the attitude that folks should just be happy to get whatever they are given. The whole point for taking food is trying to save the family from the fuss of having to prepare meals while they are facing a burial or while dealing with going to a hospital waiting room everyday to sit with a seriously ill loved one. 3. Preferences are mannerly and good taste. Wouldn’t it be easier to ask than to guess? Fixing your favorite meal doesn’t automatically insure that you are meeting a need if what you enjoy is not a shared preference with those you are trying to help. If the food you drop off is food some in the family simply can’t tolerate then the effort has been wasted. Here is an example. My big food turn off is liver and onions. They are my wife’s culinary love. When we go to Luby’s she gets liver and onions because I won’t even let her cook them at home. If a benevolence meal was liver and onions she would love it! I would hear a call to fast! I guess I could eat the liver without fear for my life but I am afraid my taste buds WOULD die if I was expected to enjoy it. I guess I might eat the plate it was on but probably not the liver. I just don't find sautéing the strainer for every toxic poison in the blood from another body a palatable consideration for my meal time. Ha! 4. Food allergies. Perfectly good food for some is a “day at the hospital” for others! Sometimes which foods we eat is not a matter of preference but a matter of necessity. I have a friend that cannot eat onion in any form. Onion powder, onion salt, raw, cooked, sautéed, ect. Just a little bit will send him to the hospital. So doesn’t it make sense to ask if there are preferences, or dietary restrictions before you decide to take food over to a home, particularly if you plan to be there to see if they eat what you fix? Asking ahead of time is another way to show respect and another way that we can recognize the needs of the family we are serving. Doing a little research before you turn on the oven will make sure your love offerings of time and food will actually be a help and not a hindrance. The encouragement benefits for those we are trying to love on is worth the added effort. 5. Types of food - Some foods are better in grief event times than others, particularly if there is a widow or widower left behind that may or may not cook for themselves. Food that can be micro-waved is always good. Food in smaller containers that can be frozen and enjoyed later are wonderful. This will facilitate the spouse that will be alone after the funeral. After the kids and grandkids have gone home, trying to handle a 18 pound turkey is a bit much for one person. Canned goods like gourmet soups and chowders or frozen entrees like Stouffers dinners that could be opened, micro-waved and served quickly might be a good choice. 6. Shields of Gold, not shields of brass. When we give to God or to God’s people remember to give the best you can. Brass is valuable unless you compare it to gold. Early in my ministry as a pastor, I had a wealthy deacon offer me a set of used tires for my 1967Mustang. He had taken them off his wife’s car because she thought they were dangerous, (they were as bald as some of my friend’s heads now). He had bought her a new set and decided to give the leftovers to us. Now, some used tires are worth putting back in service but these weren’t. He wanted me to bless him for his gift as if he were giving me a set of NEW tires by letting MY wife drive around town with tires that weren’t good enough or safe enough for HIS wife. Do you get the picture here. Give your best whatever that is. God blesses generous hearts. 1. Unexpected visits can be intrusive. Dropping in might mean you’re in the way! Be very careful if you have no appointment. If the family is eating or preparing a meal, you might consider not staying, even if they invite you to. Remember they were not expecting you to be there. Try to not disrupt their schedule. Death and sickness has already done enough of that. The family is going to be appreciative when friends visit and they want to be accommodating when receiving guests. Just remember that after days when people keep coming by, emotional and physical fatigue sets in. So, protect the ones you are trying to encourage by calling and asking what would be a good time for you to come. 2. The telephone is a wonderful thing! When you visit the home of the family, call first if you can. If you can’t call, then plan on staying a short time. If you are dropping by unannounced, (you really ought to call if you can) be observant to what is going on when you arrive. A short visit and prayer demonstrates that you care. You need to be the one responsible for saying, “Let me lead us in prayer.” Then excuse yourself. The bereaved one may not even have enough emotional strength to end the talking or to even ask for prayer. This is another “you are God’s hands” moment. Touching others in Jesus name is a good thing. 3. Don’t assume the family is on your schedule! In fact don’t assume they are on their usual schedule. Just because you are up and running at 7 am doesn’t mean the family will be. As a rule, 9 am is as early as phone calls should start, and 10 am for visits to the home. 4. Open you eyes and watch, look and listen! Look for a place where your visit won’t intrude on others. If someone is trying to cook in the kitchen then don’t make that room the visitation center for your visit. Take it upon yourself to suggest going to another room that is not quite so congested. Here is how. Simply ask that all who are not otherwise engaged in a task to step into another room to have prayer. The ones that are able to stop what they are doing will go with you. The ones trying to prepare the meal or are busy doing other things will not feel pressured to leave their tasks. Burned food won’t make anyone’s day better. 5. Everyone needs some alone time. Families want to be hospitable. However, regardless of how close you are to them, there are times when company is an added stress. Be a servant! Help those who can’t or won’t manage time for during grief events by being aware of their needs. During a grief event, sleep is needed more than ever before. However, rest is usually a rare thing for people with broken hearts. You need to be observant enough to see when someone is tired. Speak a word of release and suggest they go and try to lie down and rest. Tell them it is ok to worry about themselves for a little bit. Encourage them to at least lie down for a while whether they can sleep or not. Sometimes even though they are exhausted, they’re just waiting for their friends and family to give them permission to go lie down for a little while. 6. How long should you stay? Shorter is better than longer. Look at your watch before you dial the number or ring the doorbell. Schedule suggestions - No physical visits earlier than 10 am and no visits later than 8 pm unless you are specifically asked to come earlier or later. Don’t call until 9 am, even if they are known to be an early riser and calling at 7:30 am would usually be ok. Remember this is not a usual day. Give them the extra time, just in case they are sleeping late because they tossed and turned until 4 am. The way we keep from intruding on their rest schedule would be to “expand the window” for what time we would usually go by or what time we would usually call. Let me show you why the length of your visit should be of reasonable duration. There will be other people coming by besides you and your family. Do the math. If 25 different people come by in a day, and each visit lasts just 15 minutes, then how long will the family spend talking? The answer is “give or take” 8 – 9 hours! Just talking. Just because you have the time does not mean the family has the time or the fortitude for a long visit. Funeral time is time off from work. Funeral time is anything but a vacation. 7. Be a part of the answer is to make sure you are not part of the problem. Make your decisions about “time”, based on what is best for the family, not what is most convenient for you. Remember the family is busy - I never knew how many tasks and details there were when preparing for a funeral. My parents had a trust and pre-need funeral package. There were still a huge amount of work to take care of to get ready for Mom’s service. So let me say this again. Be practical and considerate about time. Long Term Love - How to help IF you really want to help someone going through a grief event. The real need for a visit will be starting 2 weeks after the funeral and then about once a week for the next six months. After that the birthday of the deceased, the date of their wedding anniversary, Christmas, the anniversary of their loved ones death and funeral are all dates Satan has put on HIS calendar to try and lambaste them with discouragement, loneliness, despair, and emptiness. These follow-up visits can be much more detailed and inquisitive. 1. What kind of food did you have to eat yesterday. 3. Are you doing ok with the insurance paperwork? 4. Do you feel you are able to sleep ok? 5. What did you do for lunch last Sunday. 6. Did you eat alone? 7. What is the most over-whelming thing to you about losing ________ ? 8. What did you think was going to be difficult but has actually been easier to deal with than you thought it would be? 9. Where have you most seen the evidence of God’s love through all of this? 10. Are you able to pray? Let’s debunk some typical grief statements. These are statements people make and genuinely mean from their hearts because they sound right. The problem is that words without follow-up action set up false expectations. Expectations are powerful forces in the perception of people going through a grief event. Remember this! In the church we hear much talk about how Jesus will be there for you when suffering comes. We hear much talk about how the church family will be there to help and encourage. Sadly, in many cases that is what it is. Just talk! Many times what was meant for good becomes the source for hurt. Without a compassionate follow-up plan during a grief event year, making these statements during a grief event will set our words up as disingenuous attempts to convey compassion and concern. The truth is we are all guilty of focusing on our own needs too quickly. Living for others is difficult but not impossible. Real long term grief ministry is truly part of loving what God loves. For God so loved the world, that He gave . . . ! a. Most people do not want to be a bother or imposition. They are NOT going to call and ask for help. It feels too much like begging. b. Pick up the phone! If you’re really going to help someone don’t wait until they call you. You MUST call them if you are going to find out how they are really getting along. a. No, time does not heal all wounds. It simply deadens the pain. The wound is still there. God’s grace will eventually turn the wound into a scar and his grace will turn the scar into part of their testimony. Eventually. We must be patient with the patient. The enemy will try to make it appear as if other folks are too quick to get back to their own lives. They won’t appear willing to actually stay and help. A long term visitation plan can change all of that negative potential. It only takes a few special people to make the church body appear to be caring and generous. However, any way you cut it, grief ministry takes an investment of time. Love is not just what you say. Love is also what you do. 3. Well you just have to pull yourself up by the bootstraps and move on you’re your life or if life gives you lemons then you learn to make lemonade! a. Not only does this condescend, it also assumes something that is not scriptural. It assumes we have the strength to pull ourselves up. No where in the Word of God do we find this taught. Father God has done all He has done for us because we COULDN’T DO WHAT WE NEEDED FOR OURSELVES. b. People in the midst of grief have tunnel vision. They don’t think right. They don’t feel right. Many times they aren’t right. However they don’t need correction. They need compassion. It seems like the whole world should revolve around their loss. It feels like no one else has ever suffered like they are suffering. When it only been a week or two after their loss, they don’t need us to scold them or shame them because they are cross or angry or even selfish. They are probably just getting over the shock enough to start feeling the real emotion that can only be healed by Jesus. Preparing for your own home-going. Do something now to help your family get through the Hurt! 1. Stop putting off making the arrangements for after your death. No matter what kind of estate you have, you need to set up a financial tool that will handle all of the disbursement of your material possessions after you are gone. decisions ahead of time. Even with act there are things to handle but without a in place the arrangements would have been unbearably difficult. 2. Consider doing some other things ahead of time for the sake of your family and your mate. a. Pick out your own caskets. b. Choose and purchase your own burial plots. c. Pay for the opening and closing of the burial plot. d. Write down what your obituary should say. e. Pick out the music for your service, ect; Mom had a funeral file with info about who should take part, what songs she liked. I would have never chosen the right music if she had not written it down. f. Save some money for emergency - Dad and Mom had saved money for this type of emergency. There was a fund available that was used for the expenses of the unexpected 2 weeks stay in San Antonio. That fund paid for 4 hotel rooms for two weeks, a rent car, two full fare airline tickets, restaurant and cafeteria food for 5 people, along with other miscellaneous expenses like transferring mom's body back home to Oklahoma. 3. Learn to speak words of blessing over your family while it is day for the night approacheth! If I had waited until this hospital event to try and tell my mom how much I loved her, I would be dealing with a huge amount of regret right now. For starters, she couldn't have heard me for most of it. It was too late for an in-depth discourse of how grateful I was to have her and daddy in my life. She heard a few things through the pain and the tubes but she was so sedated that long conversation was impossible. The only thing we could tell her was that she was loved and we were with her. Then we told her goodbye. A good while ago, I got into the habit of speaking blessing on my parents, my wife and my son. I got into the habit years ago of speaking blessing over my parents, my wife and my son. My mom is gone. Do I miss her? Yes! Remorse? Was anything left unsaid? NO! I have no remorse about what could of been or what should have been because I spoke to my mom often over the years about how precious she was to me. I wrote letters and shared my heart with her. I tried to speak to her and to my dad during the last 15 years as if the day we were all living would be our last day. Eventually it really is our last day on earth. Two weeks ago if it had been me in the casket my parents would have no remorse either. They have been speaking blessing for years over me, and my wife, and my son. I have a picture of my dad and my mom laying hands on my son and his wife to be the night before the wedding just a month ago. They prayed blessing and protection. My son's LAST memory of his grandmother is her praying over him with her knarled up hands laying on his head asking the Lord to fill him with the Holy Spirit and use him to the glory of God. Don't wait to try and restore a broken relationship. Don't wait to bless your loved ones if you haven't already been doing it. Some of you need to tell your parents, your spouse, and your kids how precious they are to you and to the Lord. That way any curve ball the enemy throws at your family will miss the strike zone. God does NOT intend on you sailing your ship alone through your days on this earth. Another way to get prepared for life and death is to get connected to a church family. Get involved. Invest your life and resources into a place full of people that love Jesus with their whole heart. They will be the ones that will lift you up in word, in deed and in the prayer that will get you through the hurt of losing a precious life like a parent or a child or a spouse. Tragedy is a fact of life. Facing it alone is not! My parents church family have become the feet, the hands, the touch, and the voice of Jesus as they have ministered to my dad during this time. The church family has also been the testifying voice that has declared my mom's faithfulness to the Lord and to her family. Live your life by loving the things that God loves. One thing He loves is the Church – the body of the Lord Jesus. The church that God loves is the one that serves a perfect Father and is full of imperfect children. Dad and mom had the foresight to take care of all the above things. They had been paying on the list above for a long time because they didn't want either one of them or any of their children to be left handling a bunch of business with a broken heart. I think that is just considerate. Don't you? By taking care of the business end of dying ahead of time, we were allowed the dignity of grieving in private and getting into a place that Father God could heal our hearts to face a funeral with some hope and heavenly joy. There have been many, many, many that used the expression that “your mom is in a better place.” They started using those words just minutes after my mom died. My mom’s “better place” was not a source of joy until I was able to emotionally cut the comfortable ties I had with her living “in this place’. My mother’s body was not even cold when a nurse said to me, “At least she is in a better place.” I didn’t rebuke her. She meant well. 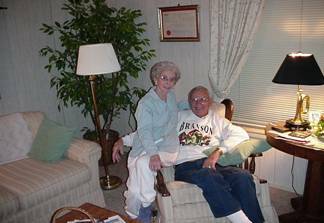 She had served Mom well as her caregiver as a friend to our family. There was no comfort from what she said because it was too early yet. Theologically. I knew where my mother had gone. Emotionally however, I was not ready to consign my mom to heaven. At that moment I still had the last little dab of hope that we would take her home healthy still rolling around in my heart. The hope for recovery was slowly seeping out and was being replaced with the realization that she was gone. Her death had not sunk in yet. I had barely begun to grieve. The words “well she is in a better place” did not comfort me. Those phrases comfort me now, but Father has already done a work of grace in my heart that He had not done back then yet. In the days before Mom’s funeral those words were spoken into my ears by well meaning friends but in my heart something else was going on that was perfectly natural. Those words actually sounded to me like they were saying “better not cry, better not wail, better not hurt.” Our friends certainly did not mean their words in the way I heard them They did not intend for their encouragements to wound. In fact, their words were based on the Godly testimony of my mom’s life and love for Jesus. The point is this - the timing must be right for some types of words to heal. Just because they are true does not mean the time has come for them to be spoken. Truth is truth. But knowledge of what could happen theoretically is worthless, when you need a specific miracle to happen, like in the case of Lazarus and here recently in the case of my little mother living all hooked up to machines and tubes in ICU. My soul! When Lazarus was lying dead in the ground, his family knew what Jesus could do. In fact, he must have already been in the better place because Jesus wept at the thought of bringing him back. The family didn’t want to lose him and they knew their only hope was the power of the Lord. Notice Jesus didn’t rebuke them for wanting Lazarus back. This leads me to believe he won’t rebuke me for wanting my loved ones back either. What He will do is miraculously might my need. NO one had to convince Lazarus’s family that Jesus could fix their problem. They certainly didn’t need to hear again what Jesus could do. Ten seconds after my mother’s life was gone from her body, NO ONE needed to tell me what Jesus could do. I just needed Him to do it. Old Laz’s family and I had reached a point of agreement, where we just really needed Jesus to do what He does. Heal, comfort, bless! Death brings all of us to a place where we either need a resurrection or a release. Our human-ness would probably choose a resurrection most of the time. The hard part is that a resurrection in not in the cards in every case, until later at the day of the Lord. If we aren’t going to get the resurrection we want, then we need a “catch and release” restoration. Restoration is every bit as big a miracle as resurrection. When a loved one’s death is the will of God then those of us that are left behind, need to “caught” by the grace of God so we don’t fall into despair and hopelessness. We need to be “released” from living in denial when we are facing an event that puts the will of God in a juxtaposition to our own will. We need to be “restored” to a place where we can go on to the end trusting God even more than we did before death left a bad taste in our mouth. A catch and release restoration will destroy our tendency to get stuck in the past and forget that we have a bright future where we will be reunited with those loved ones that died in Christ. It’s kind of this way. Grief brings us all to a place where we communicate with God with groanings that cannot be uttered. Deep screams that are so deep in our bowels and so private that no sound comes from our throats and mouths. There are times you need God to stop talking (using his people to quote the truths of scripture) and do something in your soul, down deep in the bowels of your being. (This is when the Holy Spirit surgically removes the pain of a loved ones death). There are times when God wants to stop talking to us and start doing in us. When we call on the name of the Lord, we shall be saved. OH! Preacher that is talking about becoming a Christian. Yes but it means more than that. It means if I cry out to Jesus in my grief, He will save me, deliver me, restore me and do it all in a way that no ones get credit for my deliverance except the Savior. We stay saved, the same way we get saved. Grace, Grace, Grace! When Father God does grace surgery He restores us to life. He resurrects us from the dead. Glory! God’s surgery doesn’t remove the memory we have of our loved ones. God’s surgery doesn’t remove the hurt of them not being there. His surgery gives us hope for the future and gratitude for the past we had with them. His surgery removes the debilitating crippling paralyzing effects of the attack of the enemy. The oil of the Holy Spirit neutralizes the poison of the venom of death. Death is still a reality. My mom is still gone. But truly death has lost it’s sting, just like I Cor 15:55 says that it has. I have experienced this resurrection miracle in the last several weeks. The Lord resurrected my joy. He has resurrected my hope. He has resurrected my resolve and purpose to go on to the end with Jesus. I can’t believe raising Lazarus was any more impressive to his people than what the Lord has done for me. My mom died after fighting as hard as she could. We prayed and believed God as much as we could. 1000’s of warrior believers all over the world were speaking healing on her and wisdom on her doctors and faith on us in the waiting room. Still she died. Before her being in a better place could comfort me I had to receive by faith that God’s perfect will had been done even if that meant losing my mom. Think about this. The only hope that will enable us all to move on with life is a miracle. I had to accept the fact that God knew what He was doing even though it did not agree with what I would have chosen. My dad had to accept the fact that my mom going home and away from him was the absolute best for everyone, including him and mother. It is un-natural to accept things like that. It is not natural to let go of a love relationship like my parents shared, or that my mom had with her kids. It takes a miracle that no counselor can provide for us to release her and for her death to release us. It takes a miracle of God’s grace that can’t be hurried or manipulated into existence. But it comes. The dawn turns to morning. Life goes on because of the sustaining miracles of God’s grace. Until Father God and I came into agreement that He knew what He was doing, his Word promises had no chance of being my consolation. “Standing on the promises” are impossible when you are still holding to possibility that your loved one should still be standing on the premises. There are times we need the kind of touch that only the Lord can give. Until His touch comes, no one’s theologically correct words will be enough. It is not like we don’t already know about the “better place”. Dealing with the “real home-going of someone that walked the walk of Jesus” produces a testimony about the departed on that the family really does already know. They know the truth about how they lived. They know the truth about how they died. They know the truth about where they have gone. But . . . it takes time and the touch of Father God for that fact to become a blessing, instead of a reminder of their loss. They haven’t forgotten the faith of their loved one. They haven’t forgotten the words of Jesus in John 14 that He has gone to prepare a place for them and the loved one just departed. They need time to emotionally replace bible theory about heaven with bible facts about heaven. Faith or not they just had to make an unwilling, unexpected deposit into the bank of God’s grace and it takes a little getting used to that we have made a good investment. Why is it so hard to let go? Why can’t we release our loved ones even when they absolutely walked in relationship with Jesus? Are we really guilty of a unbelief or a lack of faith? I don’t think so. There is a normal perfectly acceptable reason placing our saved loved ones in God’s hands is so difficult. Man was never intended to die. Grace is available because God in his all knowing heart knew about Adam in the Garden before the dastardly deed was ever committed. There has only been one place in human history that grace could not reach. Grace could not reach the man on the center cross at Golgotha. That separation of Father and Son was to make my separation from my mom lose it’s sting and to allow it to be bearable by giving us the promise that she has a place in the heart of God that we can one day journey to also. That is all theory, until the same touch that rolled away the stone, reaches out and swats away the darkness and the despair from my heart. Death is a real enemy. It is the perpetrator of an un-natural separation. Has it been defeated? Yes, but it takes a little time to get that fact from your head to your heart. We are still looking through a glass darkly. We are still seeing the tapestry from the back side. We still have a human tendency particularly when we are in the throes of heart monitors, incubation tubes, surgical wounds, ICU chairs and the smell of death all around us to act more like Thomas and Peter before the resurrection than the way they behaved after they saw the resurrected Jesus for themselves. The Word says this in James. My brethren, count it all joy when ye fall into divers temptations. Brother Manley Beasley used to preach on this verse ALL the time. Learning to count it all joy. Whew! What a chore. When he was dying with several different diseases, someone asked Brother Manley. “Are you counting it all joy Brother Manley? Are you able to count the hospitals and surgeries and pain as . . . JOY yet?” Brother Manley with amputated fingers gone, lesions all over his body including inside his throat that hindered taking water in liquid form, lifted up his face to heaven with a smile and loudly said, “Nope, I ain’t there yet! But boys I am GETTING there, I’m getting there. Glory to God! Do you know what Manley was saying? God does not LEAVE us in our grief. If we will turn to Him, and wait on Him, the son will rise, our grief will lift and His touch will raise us to walk in newness of life until it is our turn to make the journey. Grief moments are a temptation to quit on the Lord. Grief moments are a time to cry as if we have no hope when we do. Grief moments are when we can choose to bring glory to the Lord even though we don’t feel like it. Grief moments are a time to shine. Getting through a grief moment just means waiting until we get our touch from Him. His touch strengthens us to release our loved one by using faith we did not have yesterday. His touch empowers us to release control concerning events and people we never had control over in the first place. So why is Father’s touch of grace so recognizable in a grief moment. During many of the other moments of our lives we are too self reliant to need a touch. Father won’t waste his touch on those that wouldn’t even recognise the touch when it came. Grief moments birth a need that we do not have the resources to meet. Grief moments declare just how bankrupt we really are apart from the grace of God. Why do we have it today and it was missing yesterday? Because grace is like manna. His touch means pointing our hearts toward heaven a little more because we have someone precious waiting on us over there. His touch means this world loses a little more of it’s luster and heaven gets a little closer and easier to see. As you hold the little head of your mom in your hand and feel the last little drop of body heat leave there is a real grief that comes which can only be defeated by the indwelling presence of the Holy Spirit. As you watch death consume the one that just days before was vibrant and laughing, you are in need of a miracle that can only come from Father. In the Garden, the smell of death, the agony of defeat, the horror of the images of Jesus death, the unquenchable pain of the women’s grief could only be taken away by the appearance of the living Savior. Nothing else will do. No substitute for Jesus himself showing up at a time like that. Nothing but His appearance helps when staring right into the gaping jaws of death and eternity. It was that way with us too. Jesus had to make an appearance before death turned into victory. Does that make sense to you. It did not to me until this event took place with my family. I honestly have done too much talking in the face of other people’s grief and not enough listening. By All Means Grieve! . . . But Grieve Like God is Still Alive! We usually use words like “well at least we know where she is, or you know JK, your mom is in such a better place that we wouldn’t want her to come back here even if she could.” Those kinds of statements are what I have been rambling about now for the last several pages. Now you know me. I am always going to use current events to try and teach others how to live according to the Word. Hopefully this gentle correction will help all of us use those words properly in the future. Grief is a real thing in every human’s life. Granted, Christians should grieve differently than lost people but still we grieve. 1 Thess 4:13 But I would not have you to be ignorant, brethren, concerning them which are asleep, that ye sorrow not, even as others which have no hope. This wonderful verse is not saying to not sorrow or grieve. It is saying to grieve differently for those that die after having walked in relationship with Jesus. My grief is always different for those that die lost versus those that die saved and so should yours. However, until a family is able to “cut the ties” and release a saved loved one the phrases “they are in a better place, (even though intended to encourage) can be a slap. The cutting of ties to our dead is a process. Cutting ties or releasing someone into God’s hand involves these things. We must acknowledge that they are gone. We must embrace the reality that what we are going through is not just a bad dream. Denial ain’t no river in Egypt! We must throw ourselves emotionally into the lap of Jesus. The lap of Jesus in a spiritual sense is a safe place where we can scream, cry, wail, or whatever we need to do. The healing point here is that everything we do is within His embrace where no judgment exists. We must gather our manna for each day. Up to now we have not needed the kind of grace necessary to get through a trauma like death. Now that we have need of a much deeper drink of living water, we can be rest assured that Jesus will be there for us during the moment of our deepest need. (God gave a supply of manna that was equal to the need of each day.) Make a commitment that quitting is not an option. Right now in the midst of a really bad time, tell the Lord you are ready to re-enlist. Your loved one, in my case, my sweet Mom, if they could come back to us from where they are would speak in run on sentences admonishing us to be faithful to Him. They would scream at us loudly about how beautiful it is, and how serving Jesus is worth it all and that we should run as fast as we could toward the Lord with our whole hearts. So I guess there is nothing left to say except “let’s get it on” and finish better than any of us started to the glory of God. After the death of a loved one there are ghosts that must be dealt with! Some ghosts need to be allowed to die. If a loved one has left vengeful notes to surviving family members stuck in their bible or their lock box at the bank or any other place be part of healing your family not continuing a feud from the grave. Giving hurtful documents to the living does no good for anyone. Shred them, burn them but whatever you do, don't pass on things that wound the living, no matter how much you think they deserve to hear those hurtful things. Do what Jesus would do. He would protect and He never gives us what we deserve. He always offers grace and His grace COVERS a multitude of sin. Some ghosts are good ghosts or memories that need to be retained. Make sure sentimental things are talked about. Celebrate the life of the one that has gone. Don't fixate on their going, or on the loss. Focus on the good times, the good memories, and allow time to erase the bad stuff. Recognize that every trunk in the attic, every box in the closet, every picture, every letter kept, are all things that have ghosts in them. Some are good. Some not so good. Don't try to deal with all the ghosts in a day. Take your time. Let your emotions rest before trying to clean the house and get ready to for the yard sale. Let the friends that want to help actually help! their emotional attachment will not be as great as the immediate families will be. I made a real mistake. My dad was killed in a car accident and we needed to go and clean it out so the insurance company could take it. I went to clean out the papers and trunk, forgetting there would be blood in the car. When I looked in and saw the evidence of my dear Daddy's pain the last four hours of his life, the strain was more than I could handle. For a few hours, I was paralyzed with hurt. I should and could have let someone else clean out the car that was not a personally involved with my dad's life. I just didn't think about it. No one told me. That is why I am telling you now. Well I hope this has helped someone deal with the whole process of dying, getting ready to die, and getting through the process of burying someone they love. I am praying that all who read this know the Lord Jesus in a personal way. If you don't then keep reading and your life can be changed today! God bless you! Picture holding the title deed of your life and holding it out for Jesus to take in His hand.